Charles Lavigne getting set before the game. Rum Row was packed. The PA system was muffled but loud. The crowd was big and there was a warmth in the old rink that hadn't been felt in years, maybe almost a playoff feeling. 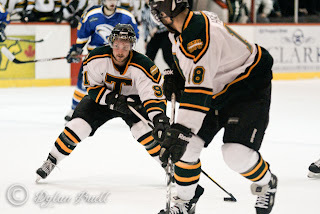 The 2011-2012 Tommies fought to the bitter end and while the outcome was a 4 - 3 overtime loss to our long time rival Moncton, it was a great game nevertheless. After all the formalities were done and former Tommies from the past 50 years left the ice, it was U de M who came out gunning. In the first 65 seconds Les Aigles scored two goals and everyone was thinking the worst. But the old ghosts that haunt the LBR and a timeout called by Coach Ryan helped to settle down this young bunch of Tommies. Chris Morehouse scored STU's first goal. Chris Morehouse, who has great ties to the Beav, scored at 3:44 to get the crowd back into the game and STU on the score sheet. Bryan Main and Steve Sanza drew the assists. The first period would end with St. Thomas down a goal at 2 to 1. The Tommies would draw even when the Moncton goalie got caught out of his net and Sebastien Bernier scored into the yawning cage at 5:13. STU mounted a heavy attack in the second period but couldn't find the go ahead goal, hitting the cross bar twice. Moncton would score at 18:13 - on a shot that fooled Charles Lavigne - and would take the one goal lead into the third. Charles Lavigne was amazing in the STU net tonight. 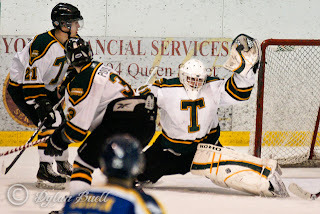 Les Aigles were assessed a 2 minute bench minor at the end of the second period and the Tommies would score on the resulting powerplay early in the third. Yuri Cheremetiev from Bonneau and Bernier tapped home a centering pass at 2:00 to tie the game. Charles Lavigne was the difference for the remainder of the period foiling Moncton on several opportunities that seemed like sure goals. It justed seemed fitting, extra time in the final game. Overtime saw STU with several chances for the winner but the puck just wouldn't go. Eric Faille scored the final goal at the LBR at 8:38 and ended a great night of hockey. I could probably write another 100 paragraphs but not tonight. 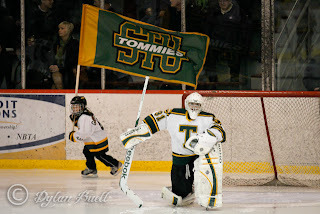 Goodbye old friend, thanks for being part of St. Thomas hockey for so many years. You will be missed. The 2011-2012 Tommies were a lucky bunch to be the final STU team to play at such a great rink, so much character, so many memories.